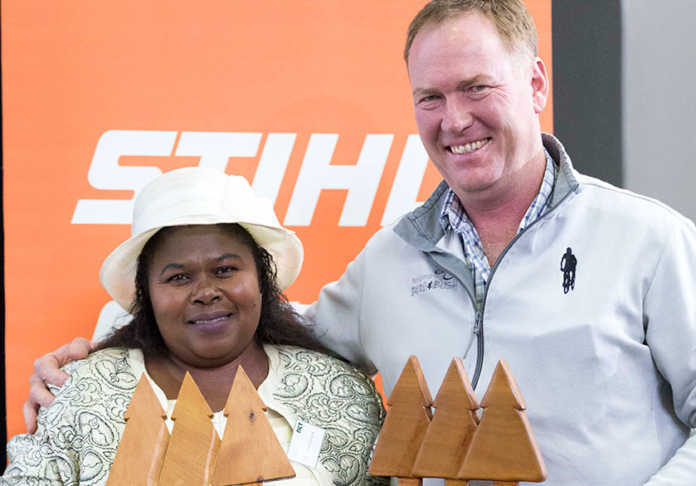 Recipients of NCT Forestry’s 2018 Tree Farmer of the Year awards were (left to right) Buyisile Mdunge in the small-scale grower category, and Jon MacKenzie in the commercial grower category. A woman tree farmer from KwaZulu-Natal’s Greytown area was recently announced as NCT Forestry’s 2018 Tree Farmer of the Year in the competition’s small-scale grower category. Margaret Buyisile Mdunge was awarded for her hands-on management style that has achieved excellence in sustainable plantation forest management. A statement by the timber marketing co-operative said that Mdunge obtained her farm, Essenwood, via her late husband who, together with 10 family members, successfully applied for a land acquisition and production grant. The Mdunge family borrowed money from a commercial bank to finance the balance of the farm’s acquisition. The statement added that even though she had no previous formal training in forestry, Mdunge quickly learned from the technical support provided to her by NCT Forestry employees and she “showed a clear instinct for timber farming”. “She has converted her low-lying wattle compartment into a frost-tolerant species and is today reaping the benefits of this. She controls weeds by grazing her small herd of goats and cattle. Buyisile oversees all the farm operations herself and has a hands-on management style,” NCT Forestry’s statement said. Jon MacKenzie, of KwaZulu-Natal’s Harding area, won the competition’s commercial grower category. NCT Forestry praised this timber, beef, avocado and vegetable farmer for his “exceptional silviculture practices, good site [to] species selection, effective harvesting and loading operations, and a good farming ethic [that] are compliant with all aspects of sustainable plantation management and minimising impacts on the environment”. MacKenzie was also recognised for running a programme to upskill his staff and for donating vegetable seedlings to his employees for them to grow for own consumption or additional income.